Home Blog Why Test Embroidery Designs? Why should you test an embroidery design? Isn’t that the job of the digitizer? I’m convinced there are two types of embroiderers—those who test and those who wish they did! Yes, it is the job of the digitizer to test the design before making it available for others. When a design is custom digitized, the embroidery is specifically created to work on the target item. The color and type of fabric is carefully considered as well as the type of item it is—say a flat garment versus a finished cap. Stock designs are digitized for a mythical “average” fabric. According to one major stock design company, this is poplin with two layers of cutaway. I don’t know about you, but I don’t often embroider on poplin and I don’t want two layers of cutaway behind it! Typically, a stock design is targeted for medium weave fabric of neutral color with no pattern or texture. Additionally, the fabric is hooped on grain between the rings of the hoop with the appropriate stabilizer. I imagine average fabric to be something similar to kettle cloth—not too tightly woven nor too loosely, a medium weight fabric with some body to it. 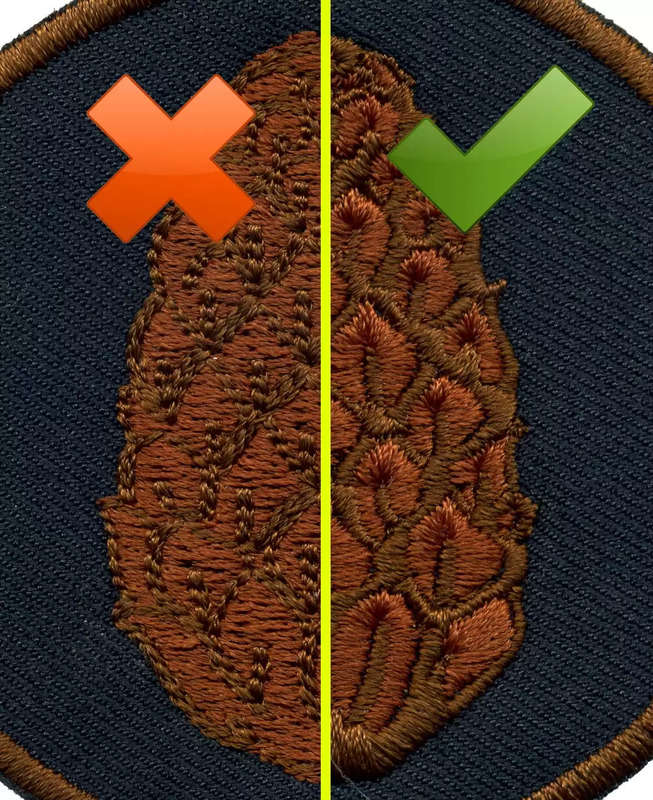 Chances are, even if you are sewing the design with no modifications (resizing is the most common modification), you are sewing under different conditions. Who really embroiderers on “average” fabric? You are using a different fabric; machine; different thread colors, brand, or type; needles; bobbin; stabilizer, etc. Even if they are the same as what the digitizer used, machine tensions may be different and even environmental conditions can affect the outcome. I test a design even if its one I digitized and have already tested in the past. I want to make sure it transferred to the machine properly, that my machine tensions are correct, that I like the thread colors when combined with this particular fabric, that my stabilizer offers the necessary support without contributing unnecessary bulk or stiffness to my project.